Prejudice, stereotyping, bias—however we understand these tendencies and attitudes, we can learn to identify, confront, wrestle with, accept, and change them within ourselves. Sometimes, however, doing so is possible only with great difficulty. Discrimination takes many forms, including harassment, bullying, hate speech, and scapegoating. Such behaviors put others at risk, cause harm and—at times—may even threaten lives. Given our current national and global tensions, what can an ordinary person do to reduce Islamophobia and the threat it poses to us all? Shortly before the holidays, Gary Reiss, Ph.D., a process worker and LifeWorks colleague in Portland, OR, sent an email to our community about curbing Islamophobia wherever we encounter it. Gary’s email referenced a Huffington Post article written by Manal Omar, Associate Vice-President of Middle East and Africa Center at the United States Institute of Peace. 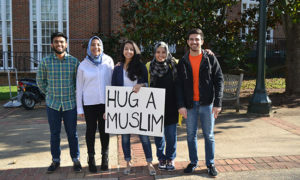 In that article, Omar shares eight actions anyone can take to help concretely reduce the threat Islamic Americans may feel in the our nation’s current political climate. I am reposting the actions that Omar enumerated. You may want to think about and consider using some or all of these in your daily life. If you see a Muslim or someone who might be identified as Muslim being harassed, stop, say something, intervene, and call for help. If you see people abusing authority, stand firm against profiling. If you ride public transportation, sit next to the hijabi (head scarf) woman and greet her. The fear of being in public for women in particular is increasing every day. A small act of kindness can have a transformative impact. Engage the Muslims in your life. Make sure you really feel comfortable standing for and with your Muslim friends, neighbors, coworkers. If you have a Muslim work colleague, check in. Tell them that the news is horrifying and you want them to know you’re there for them. The concern and support I have received my colleagues is heartwarming and reminds me of my place here in the US. If you have neighbors who are Muslim, keep an eye out for them. If you’re walking your kids home from the bus stop, invite their kids to walk with you. Talk to your kids. They’re picking up on the anti-Muslim message. Make sure they know how you feel and talk to them about what they can do when they see bullying or hear hate speech at school. Help fill the public space with positive messaging over the hate. Write letters to the editors and be aware of your social media posts. Call your state and local representatives, let them know that you are concerned about hate speech against your Muslim friends and neighbors in politics and the media. Ask your representatives to be aware of new laws on visas and other issues that would create second class citizens. Out yourself as someone who rejects Islamophobia and discrimination of any kind. Click here to read Manal Omar’s article, “As a Muslim, My Heart Freezes with Fear,” in its entirety. If you or someone you care about has experienced Islamophobia or any kind of bias based on a negative attitude toward a certain religious, cultural, or spiritual belief or expression of identity, know that you are not alone. Religious and spiritual minorities often face harassment, prejudice, and stereotyping, sometimes on a daily basis. Whether this treatment arises from ignorance or malicious intent, it frequently leads to feelings of frustration, isolation, depression, ostracism, anger, self-hatred, and hopelessness—feelings your aggressor may, in fact, be tangling with themselves. As each of us travels on our own journey of self exploration, only you can determine which spiritual path you choose to follow or disregard. However, as Manal Omar makes clear, there are some simple steps all of us can take to challenge discrimination, comfort those who are hurt, and seek help when we need it. Making the corner of the world where we live a safer place is something each of us can do.